Please see below a new opportunity from TARGETcareers - Public Sector Audit. If you are interested in finding out more you can click the link in the email or visit the TARGETcareers website. In an ever changing world, managing your career is a lifelong process which begins at school. School teaches young people responsibility and creates habits for the future. Education helps to build opinion and the confidence to have a point of view. Throughout the school we encourage students to develop an understanding of themselves, their strengths and their skills in order to assist them in their future choices on leaving school. Mrs Michelle Seaman is an independent Careers Advisor who offers specialist, impartial careers and further education support and guidance within school. This includes 1:1 careers interviews, the development of the careers in PSHE programme and the co-ordination of a range of activities which helps to enrich students with ideas to investigate their own futures. We welcome independent external sources of careers guidance through a range of speakers and activities such as STEM and Healthy Living Days as well as opportunities for students to talk to further education providers, employers and universities. Our aim is to enable students to make the right decisions for themselves at key points in their education based on investigation, information and inspiration. Please click here to see the programme of events across the whole school. Cove School is committed to creating and maintaining quality relationships with employers from the local area and has a number of links with a range of different companies who support the school in issues related to careers advice and guidance. This support ranges from STEM activities to career insights as well as attendance at career fairs and enterprise days. Any employer wishing to discuss how they can get involved should contact Mrs Jacqui Powell in the first instance either by emailing j.powell@coveschool.uk or calling 01252 542397. All teaching staff at Cove School are committed to embedding careers information into the curriculum. In addition to this all staff are involved in career related PSHE days and organise their own internal and external employer led activities. Year group tutors deliver a programme of activities on a range of topics, including careers, during tutor time and control the feedback forms completed after all career related activities. The VLE is also updated regularly so that teaching staff have access to presentations that have been delivered about careers as well as information regarding ongoing initiatives. The library holds a wide selection of college prospectuses and career option information. This literature is constantly updated and available for students to take home as they please! Jacqui Powell is our Careers Co-ordinator. If you have any queries about careers, please see her in the library. Michelle Seaman is in school every Tuesday and Thursday holding 1:1 Post 16 Option advice sessions for year 10 and 11 students in their final 12 months at school. Although all students will be offered an appointment, students may make their own appointment to see Michelle by speaking to Mrs Powell in the library. Michelle has an ‘open door’ policy and students can also drop-in to speak to her during break and lunchtime on these days. Michelle is also available at the year 11 parents’ evening in the autumn term and the year 10 parents evening in the summer term and offers advice and information to both students and parent/carers. 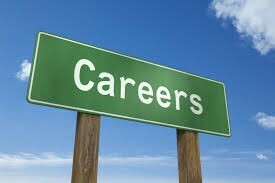 Our Careers Fair is held in school every October during the school day. Representatives from local colleges and Career providers as well as a selection of employers visit Cove School offering advice and guidance on the various courses available ranging from A’ Levels, BTEC courses and apprenticeships. Students will have time to speak to a wide range of Post 16 providers, gather information on courses, college life and the various routes available to them Post 16. This is an exciting time for students, however with the wide range of choices available it is important that students do as much research into the courses they intend to apply for. Students should apply to more than one Post 16 provider in order to keep their options open until they receive their GCSE results in August. Students should attend College Open Events - a timetable of which can be collected from the library, alternatively students can log onto the individual college websites to gather this information directly. The links are below! We aim to offer all students as much guidance and advice to assist them in making informed decisions. Students can speak to their tutor, Progress Leader and Michelle Seaman (Careers Advisor) anytime they need to during their chosen Post 16 application processes. College application forms should be submitted directly to the students chosen college, the college will then contact the school for a reference, once the school has provided a reference, students will be invited into college to attend an interview. Please click here to download a word document detailing the three main routes to qualifications. Please note... that Farnborough 6th College interviews are held in Cove School during January. Students will be given advice and guidance on interview preparation and technique prior to their interview. Useful links for more information! www.ucas.com - The University and colleges admission service – the one stop shop to find out about degree courses and entry requirements. Apprenticeships.org.uk - Government portal to apprenticeships packed with apprenticeship opportunities and information, advice and guidance. Click here for the December Edition of their Apprenticeships pack. The Knowledge Academy - The Knowledge Academy is a global training provider delivering professional training courses and apprenticeships in thousands of locations worldwide. www.notgoingtouni.co.uk - Excellent information covering alternatives to university. TARGETcareers - Explore options for careers, university or apprenticeships and get help applying successfully. www.jll.co.uk - Click here to be taken to JLL's newsletter all about apprenticeships. Network Rail Apprenticeships - If you're thinking of becoming an engineer, National Rail are offering apprenticeships. It's something to think about for when your child turns 18. Read their brochure here. Also, find interview techniques here. Bosch Automotive Apprenticeships - Click here to read the Bosch leaflet all about their Apprenticeship scheme. Remit Group Apprenticeships - Remit are working with Pritchard's Garage Ltd in Alton, who are taking on two apprentices at the end of the academic year. These opportunities are: Vehicle Body Repairer & Vehicle Paint Refinisher. 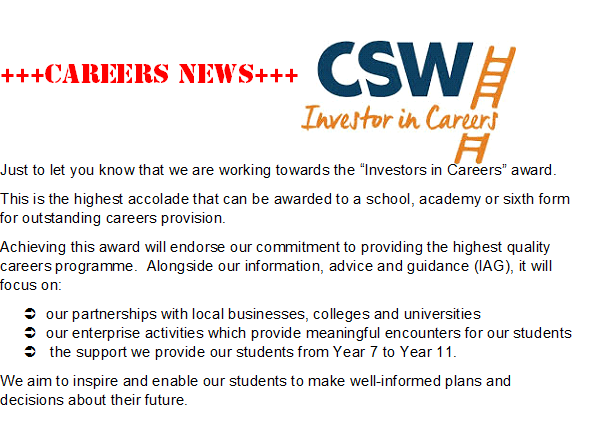 www.careerpilot.org.uk - Information on post 16 and post 18 options and the routes to different qualifications and job sectors. There are also job profiles and career tools to help you decide. www.icould.com - Take the Buzz quiz and find out what you're like and what you could do. Tuchbands - Tuchbands Chartered Accountants and Tax Advisors have pur together a guide which covers how to be a chartered accountant. National Careers Service - National Careers Service provides information, advice and guidance to help you make decisions on learning, training and work. Find more info on their website here or click here to view their e-pack. Premed Projects - Medical work experience with Premed Projects in the UK, India or Thailand will give you hospital work experience like no other. BBC Bitesize Careers - Whether you’re deciding what to study, taking your exams, planning a career, or just curious, we’re here to explain the world of work, with advice from people who've found the right path for them. www.indeed.co.uk - An online ‘jobs board’ that allows you to search in your locality for jobs you are interested in. This helps to gather some labour market intelligence by assessing how many jobs there are along with salaries and entry requirements. www.cv-library.co.uk - With over 165,000 live jobs and over 10,000 recruiters, they are the UK’s largest independent job site. Adzuna - We search thousands of websites and bring together over 1M unique, live jobs in one simple search. www.startprofile.com - Start is an online careers platform that has a wealth of information on labour market information (LMI) and the world of work including jobs by industry with qualifications and salaries, employment by region and live availability of jobs. Labour Market Information - Click the link to see a poster from the LMI about employment and careers in the different areas of the country. LMI for all - LMI for All is an online data portal, which connects and standardises existing sources of high quality, reliable labour market information (LMI) with the aim of informing careers decisions. iCould - iCould allows you to explore lots of different job types based on the subjects that you've taken for your GCSE's. Step into the NHS - Step into the NHS shows you all the different career paths that you can take within the NHS. U-Explore - Leading the way in careers guidance. Careers and employability solutions for schools and colleges. Enterprise M3 - Collaborate with us to connect with organisations, people and ideas. Go Construct - The Go Construct website showcases the many career opportunities available in construction and the built environment. www.knowledgetrain.co.uk - Knowledge Train provides you with accredited instructor-led training at various venues, and online too. Surrey Satellite Technology Ltd - At Surrey Satellite Technology Ltd (SSTL) we are committed to developing our early careers talent and are looking to recruit and develop people into the stars of tomorrow. How to Become a Plastic Surgeon - Mr Alex Karidis, a highly respected surgeon, has put together a guide for anyone considering specialising in a surgical career. How to Become a Criminal Solicitor - Lawtons Solicitors have put together a guide on how to become a Criminal Solicitor. It also explains what the job entails.